And perhaps one of the best choices for a romantic getaway this time could be The Down Under, as it has so many romantic places to offer. Especially if you want to place those hugs and kisses in a luxurious setting. There is a place where you can roast munch mellows over a campfire before going to sleep in your luxurious tent, and it’s definitely a once-in-a-lifetime experience. We’re talking about the Paperback Camp in Jervis Bay, in New South Wales. Tents, such as the King Deluxe Tent, that you simply have to try, out, comes with a standing bath and an open air shower, which makes this place the perfect romantic getaway for a weekend. It’s located very close to Sydney, so you can also take a trip there after checking out to check out Sydney if you want. Even though it’s a bit dangerous (if the possibility of seeing a snake is dangerous), it’s this fact that makes this camp an amazing resort. Just light the candles once the sun goes down and enjoy in endless romance. @saasha_burns & @brookiechook Poolside enjoying our Girls Getaway Package. Visit @forevernew_official for your chance to win your very own girls weekend away! Another great place in New South Wales is the resort that you simply have to see if you’re a spa lover and want a complete spa experience. The amazing Byron Bay accommodation Byron at Byron comes with the full spa package – starting from facials, to body treatments and massages, which makes it an amazing place to spend your weekend. If you opt for this choice, you will also experience the amazing dishes that this resort offers, and even the outstanding beauties of the bay. The fact that couples often choose this place for their wedding celebration is the definite proof of its beauty. As far as the rooms go, you can find three types, and one will definitely be according to your wallet – there is the standard room which is child-friendly and very beautiful and minimalistic which even comes with its own kitchen, the superior suite that’s located very close to the resort’s central facilities and the deluxe spa suite that’s located in a private and secluded part of the resort. Is there a more beautiful picture of a romantic getaway than the one that involves snow, Alpine air and hot tubs on the balcony? If your answer is ’’definitely not’’, then you know that you just have to visit the Huski Luxury Accommodation and indulge in everything it offers. This accommodation is located in the heart of Falls Creek Village, and it’s home to 14 self-contained apartments of different sizes. You can find whatever size you want, starting from a studio apartment, to a four bedroom penthouse that can be enough for even 10 people. If you chose to go on this romantic getaway in Australia mostly because you like everything about Australia and you want something quite authentic, don’t miss this spectacular resort. El Questro is located in WA (Western Australia), in the untamed Kimberley Region, which means that you get to see the true, wild and rugged nature of Australia right from your window. Not only will you be enjoying the spectacular wild nature while you’re taking a shower on the veranda, but you can also sign up for different activities and experiences such as watching waterfalls from helicopters, swimming in hidden holes and thermal springs and going fishing on some unique locations. NATURAL • ALTAR Swim up to a poolside pew with one heavenly view. It’s still unknown how you can spell ’’luxurious’’ without Capella, but that’s not the reason not to visit this mesmerizing place if you really want something high-quality and Heaven-like. This resort is located on the Lord Howe Island in New South Wales, and it comes with huge beds to sleep and cuddle in and even an adult bar. However, it’s the rain shower, the luxury daybed and the Lotus baths that make this experience extremely romantic and unique. If you want green nature all around you while you’re using the perks of a resort, then the Capella Lodge is the one for you. 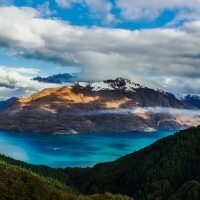 Even though you can find many resorts all around Australia and every one has something unique to offer, if you really want a luxurious experience, checking one of these five should be your imperative. Try it out and you won’t regret it! *Thanks to Zara Lewis for writing this post for Sightseeingshoes! No problem – there are so amazing places to stay in Oz!